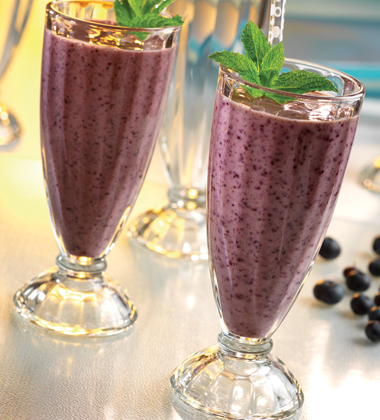 V8 V-Fusion is blended together with yogurt and fruit for a smooth, satisfying dessert. vanilla low fat yogurt	 104 oz. 3 qt. frozen raspberries	 106 oz. 3 qt. banana, medium, peeled	 100 oz. 24 ea. 1. For Each Serving: In a blender combine 1/2 cup juice, 1/2 cup yogurt, 1/2 cup frozen berries and 1 peeled banana; blend on high speed until smooth, about 1 minute. CCP: Serve beverage chilled to below 40 °F. mint, individual sprig(s)	 24 ea. 2. Pour into a 16-oz. glass and garnish with mint and/or fresh berries, if desired. banana	 100 oz. 24 ea. Other frozen fruits may be substituted including: peaches, plums, nectarines, mangoes, papaya, cherries, etc.